Peru is one of the top coffee-producing countries in the world, although it doesn’t necessarily come to my mind first when I think about coffee. So, I was slightly surprised to see that a Peruvian coffee was the newest addition to the Starbucks Reserve line on my last visit. 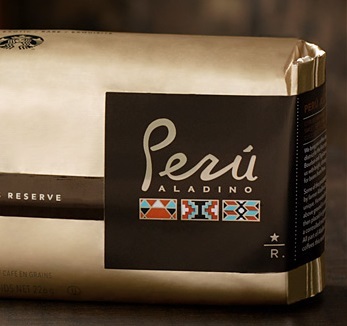 Perú Aladino is named after one specific farmer – Aladino Delgado – in the Chontali District of Peru who uses an unusually processing method for preparing his beans. The beans are fermented in earthenware tanks before being dried in greenhouses which create a controlled microclimate to dry the beans as evenly and carefully as possible. After one cup, I knew that this coffee was worth going out of your way for. It has a velvety texture and a strong toasted nut and toffee flavors, with a more subtle flavors that hinted at cream and cocoa. It is actually quite light and so well balanced that it is exceptionally easy to drink. I liked it best straight from the Clover at Starbucks, but it brews well in a french press and also makes very good iced coffee if you brew it a little stronger before pouring it over ice.